Get off the Dreadyacht and talk to Softpaw over in the hatch on the far side of the area, then when in the sheep costume go and stand on the large red X by the cannon. The barrels in this level are safe to attack up close so don't worry about getting hurt. Go down the ramp towards the green goo, use the platforms floating in it to get across to another large goo container with a larger single platform in the middle where you meet a Chompy Pastepetal, these Chompies split in two when hit (the first one has already split into two) so will take more than just the usual single hit to kill. Jump over to the left where you'll see Softpaw pop out again by the locked door. Go left and jump down onto one of the spinning arms to avoid landing in the puddle of goo on this side, jump up off it to the left to see a K-Bot Gloopgunner. Their attack is long ranged, you'll see a target circle, and if you get hit by it or stand on it after it lands you'll get covered in green goop and take damage over time. So, you know, don't get hit by it. On the left side behind all the crates is [Treasure Chest 1/5], shake it open and then head up the ramp to take out the enemies up there. Again use one of the arms to get over to the middle of the rotating platform and pick up the key, you can jump directly down to the first of the rotating arms on your way back to the locked door where you spoke with Softpaw. Go down the steps and then up off down onto a platform with some Chompies and a Gloopgunner shooting down on you, go up the ramp to get him. Carry on forwards and then up to the left to another Gloopgunner and some Chompy friends. At the top go to the right to find a Speed Swap Zone. Plenty of green goo obstacles to avoid in here, some bouncing up and down, some moving side to side. You're going to have to watch out for the side to side ones as they'll often side swipe you as you're trying to get past. The reward is [Legendary Treasure 1/2 - Masterful Disguise]. Go to the left now. The K-Bot Mineminer has several different attacks you'll need to watch out for. First up is his triple rocket attack, run out of the way of the rockets to avoid damage, it'll then teleport to another spot. Second is a spinning attack which causes a straight line of energy to rotate around the room, jump over it as it passes by. And a third attack is a slam down that causes a pulse of energy to radiate from the Mineminer that you need to jump over. After each of the energy attacks it'll also fire out some rockets before teleporting. Watch the Mineminer closely to see which one it's going to do, for the rockets the rockets will start sparking, for the line an electricity line will go down into it, and for the slam it'll jump into the air. Ignore Softpaw's surfboard and instead go stand on the left side near the yellow water, a platform should float up out of it that you can jump on to reach [Treasure Chest 2/5]. There's another spot over next to Softpaw that does the same thing, stand by the water to bring up a platform and then jump up. Watch out as you smash stuff in here as it's full of Chompies and there's a Gloopgunner up the stairs on the right. Behind him is [Wool Sweater 1/4]. Now that you've got those you can go and ride on the surfboard. Immediately turn around and head towards the camera where [Treasure Chest 3/5] is sitting. Now your task ahead is to avoid walking in the glowing red circles underneath the eye-in-the-sky bots, if you do get caught in one you'll be taken over to the pen on the left and have to try again. Make your way over to where Softpaw is by waiting for the near spotlight to come close and then walking to the left side of it straight over to Softpaw. Talk to him to get put into the sheep disguise again. With the costume on you're perfectly safe to walk in the spotlights, now go through the spotlight back near the start that was completely covering the stairs. At the top you'll find [Soul Gem 1/2 - Punk Shock]. Go back down the steps. Cross the area and go through the stationary spotlight on the right that was otherwise blocking the path down to another red X to stand on. Go down the right path through some crates where [Wool Sweater 2/4] is waiting. Now up the left path to some Chompies, a couple of Gloopgunners will also attack and then a Mineminer will appear and start on you too. With those all gone the monster gate will open to let you through. Go to the balcony on the left side to get this area checked. Once you've done that go over to Softpaw and get to solving the Spark Lock "Blowing in the Wind". This is another one with fans alternating automatically. First use Shock and go straight up to hit the green button without getting blow to the right. That'll lower a platform and toggle a pair of green fans. Now ride the fan to the right and wait on the green lightning. Switch to Bolt and ride the fan below it to the right and then over the lowered green platform, go left to where Shock started and switch back to Shock. Now go left and then down over the green platform to where Bolt started, again switch back to Bolt. Go up and press the green button to toggle the fans and raise the platform. Back to Shock ride the bottom fan to the right and pick up the blue lightning bolt, wait by the raised green platform. Get Bolt to hit the green button again and then ride the fan to the right to grab the green lightning, then simply join up with Shock over the lowered green platform. Jump on the surfboard to get to the next area. Checkpoint! Jump on the platform floating in the goop and the nozzle nearby will shoot out a projectile, this happens every time you land on the platform so don't go crazy jumping out of the way of them otherwise you'll just get overloaded with them. Instead calmly walk out of the way of the single one that pops out. Jump left onto solid walkway and go up to the Power Pod. To the left of the Power Pod is a set of stairs, next to the stairs is a Giant chest if you want to open that, head up the stairs to get up to the top and some more floating platforms, jump over them and up to a row of them, these are like the previous floaty platform but instead of plopping out a bit of goop somewhere instead when you land on them it fires a ball out from the glowing circles at the end, they're fully predictable so just land out of the way and don't jump except to move to the next one. Round the end on a platform sticking out you'll find [Soul Gem 2/2 - Doom Stone], you have to jump up to grab it. You can now just jump directly down to the large floating platform below. Jump to solid land and meet the K-Bot Splodeshard, these are just like the spinning enemies you've seen a lot of in the game, avoid them when they're attacking and attack them when they're resting. After taking them out go up the left exit and then down onto the rotating platform below. Immediately go up the steps to the left of this first rotating platform to find a bunch of crates and [Treasure Chest 4/5] hiding behind them. On the second turning platform jump to the left along a broken series of small platforms. There's two more Splodeshards over here along with a Mineminer hiding in the corner, with them dead the monster gate will open and allow you to get the [Wool Sweater 3/4]. Go back to the turning platforms and go the the top right side where there's a Bounce Swap Zone. Surprisingly the floating yellow blobs are not ideal bouncing platforms, instead they'll hurt you. Shocking. Sometimes you'll need to bounce in place on a solid platform to wait for the blob to move and sometimes you'll need to take a less direct route over the cracked platforms to get where you're wanting to safely. The last section has them really close together so you'll have to use your shadow to make precise landings. The reward at the end is [Bonus Mission Map 1/2 - Cursed Statues]. Back onto the rotating platform and this time go over to the floating platforms to the north-west, jump over them to get to some enemies. Take out the Chompies, the Splodeshard and the Gloopgunner. Go to the left along the platform and then down onto a slightly rotating platform, walk over it to pick up [Story Scroll] (on the Wii the scroll not here but is at the start of the second half of the level) and then go along the path at the back to get to an Earth Gate. The crates you're looking to smash are the big blue crates that take a few hits to open. There's one on the first platform to the right and then the other two are up at the end. There are a few enemies hiding in there too so watch out for those Splodeshards. Return the parts to get the [Winged Sapphire]. Yeah, that's not a Geargolem. Go back up and head up the steps on the right, there's a Magic Spell Punk. These cause nearby enemies to become invisible, they can still attack you but you can still see their attack effects so you should be able to avoid taking damage (on the Wii the Story Scroll is found at the back to the right behind the smashable rockets). Once you've got rid of those three go left along the path to a rotating platform that moves up and down, jump on as it's in the down position and ride it around to the other side. Jump down the small staircase to a section with another rising platform, this one's got enemies on it. Destroy the three Gloopgunners and the Chompies that appear to open up the monster gate at the back. Time for some more spotlight avoiding, the platforms here are also the variety that create goop balls so watch out when jumping onto them. Follow one of the spotlights around so you can reach where Softpaw is hiding on the other side. When in the SHEEP disguise remember that while the spotlights will ignore you you'll still be able to take damage from the goop balls. Go to the right to a red X. Quickly start going up the steps as the yellow goo is going to start rising up, it will go back down once it's reached its peak but there's nothing interesting to go back for here. Instead carry on going and you'll find a Water Gate. The task in here is to defeat Mister Chompy. He's a massive Chompy that splits into two many times over before it's beaten, so just keep on attacking the Chompies until they're all gone. Reward is [Hat 1/1 - Asteroid Hat]. Go up the steps and then down into the flooded room, wait for it to lower and then go over to the far corner, kill the Gloopgunner sitting there and wait for a chance to go over to the left corner and finish off the second one too. Go through the exit to reach a Spark Lock, "Icebreaker". First switch to Bolt and go down to the bottom before going straight back up through the green lightning bolt. Now back to Shock go right and then up and press the purple button, stay there and switch to Bolt. Have Bolt ride the purple fan over to the blue button on the left, then go down and then to the right into the middle of the puzzle. Switch back to Shock and turn off the purple fan. Now go down and ride the blue fan to the right, use the top moving platform to go to the left over to the blue button, from there go right towards the purple fan and the blue lightning bolt. Immediately go straight back to the blue button and then into the middle to meet Bolt. Time for a surf! Up the steps to your left is [Treasure Chest 5/5] (if you don't want to fight the Chompies then don't destroy the valves). Straight over from where you landed is a Climb Swap Zone. The new obstacle to avoid is fire bursts coming out of the sides at certain points, there's no rush so just wait for them to die down before moving past them. They don't quite stretch the entire way across so you should be safe at the far end of one (but obviously if there's two together that doesn't apply). The reward is [Bonus Mission Map 2/2 - Undercover Greebles]. Cross back over the floating platform and go up to the left. As usual be careful when jumping on these floating platforms, they'll throw goop balls at you. On the other side continue going to the left. Wait for the yellow goo to lower and then quickly go down the path and grab [Wool Sweater 4/4] from the very bottom of the walkway. Once you've got it quickly rush back up again to avoid the goo. Go up the other steps. At the top you'll find a Magic Spell Punk helping a Mineminer, destroy them and the Chompies that come in before going up the steps and the back and going to the right to a Dual Magic and Earth Gate. Just a quick fishing game, get the fish through the circles of eels to win [Legendary Treasure 2/2 - Skylander Scope]. Up to the left and defeat the Gloopgunner standing in the doorway as well as the three Splodeshards that appear. Go through the monster gate and head to the middle of the spotlights, careful of the rising and falling goo. Go to the right to grab the key and use it to unlock the gate at the top. Through there is Softpaw to give you the disguise again. Use it to go along the top left path and onto another red X. While fighting the two Splodeshards watch out for the goo balls being fired at you from the vents in the wall at the top. After those two are defeated two more will join as well as two Magic Spell Punks, and because there's two of them they can actually turn each other invisible too. Once those are down you'll get two Mineminers to destroy, with those down that's it. Go through the monster gate to solve one last Spark Lock, "Ping-Pong". Switch to Bolt and move right onto the orange button, that'll raise up the platforms on the left and start a fan, Bolt will start an infinite loop along the ice. Have Shock go left and then down onto the blue button to let Bolt free, now move further down and drop onto the purple button, switch to Bolt to stand on the purple platform before using Shock to raise it again. Have Shock move up to keep out of the way as Bolt comes over the red moving platform to get the green lightning bolt. Finally take Shock to the right to get his blue lightning bolt before returning to meet up with Bolt. To finish the level climb aboard the surfboard. To kick off the fight she throws an Evilized Boghog and an Evilized Kangarat at you, move out of their way and focus on one at a time. Once those are gone a pair of Evilized Sugarbats will appear, same procedure as usual but each one you defeat will cause another to appear, with the second one dead you'll also have another Boghog and a Kangarat too. A few more Sugarbats will replace defeated Sugarbats so if you attack the other two creatures instead you'll end up with less enemies on the field at once. After they're all finally gone you have to take your Skylander off the portal. Put it back on again to carry on. Move behind one of the green crystals while Kaos' Mom is firing her purple beam to get her to hit the crystal. With that done follow her through into the next room. This time we've got Evilized Screechers and an Evilized Chillydog to contend with, the Screechers are the ones you want to keep an eye on as their attacks are quite wide. A few enemies down and you'll get a pair of Evilized Snowrollers joining, watch out for the projectile they fire out when they hit the walls. You'll want to destroy the Life Spell Punk that appears first otherwise you're just doing the same damage over and over. More Screechers will replace the dead ones but the Snowrollers will stay gone. Once all are done remove your Skylander from the portal again. And again go behind a green crystal. The next hallway has a few green goo balls being fired across it, weave between the gaps, at the end there's two being fired directly at you that you'll have to dodge a little quicker. Go through into the throne room to get to the main fight. A few Evilized Greebles will jump in as well as a couple of Greeble Blunderbusses, attack them while you avoid Bubba Greebs' ranged attacks at you, the last of which is a stick of dynamite that you can throw back at him. I'd recommend waiting until you've cleared out the Greebles on the floor before throwing it back to him otherwise you won't get to do much damage safely when he's down on the floor, perhaps try using the dynamite to throw at the Greebles themselves rather than Bubba. Once Bubba Greebs hits the floor he'll send out a pulse of energy that you have to jump over, but once you've done that you can attack without fear of damage from him. After around a third of his health has gone he'll throw in some spinning Greebles who you can pretty much guide into hitting each other. Again focus on getting rid of them before tackling Bubba Greebs with his dynamite. Same as before, jump over the blast and attack him when he's down. With about a third of his health left you'll get another new set of enemies all long range attackers firing at you to make jumping a little more dangerous but still essential. With them gone take down Bubba Greebs. And again with the taking off the portal. Keep away from the purple beam while you wait for Tessa to drop a large mirror into the fight, then just walk up onto the mirror to end it. And off we go to fight Kaos, talk to Tessa, Flynn or Sharpfin to head to Cloudbreak Core. Kaos will slam his foot down onto the ledge, jump over the circle of energy that comes out of it and then get to attacking his toes. After a while he'll talk about making Skylanders go splat and then when he slams his foot down he'll lift it up and slam it down a second time before leaving it there for you to attack so don't jump straight at his foot anymore. With both feet clear of crystals it's time to go into his mouth. Attack the teeth, after a bit of damage he'll open his mouth and throw in a Fire Geargolem and some Chompies to attack you. Deal with the Geargolem in the usual manner and Kaos will slam his mouth shut again, jump over the energy and then get back to attacking his teeth crystals. Every now and then he'll slam his mouth and cause the two energy circles to radiate again, jump over them each time and just keep on attacking the teeth. A little more damage and he'll throw in an Ice Geargolem. Destroy it and attack the teeth again. Again more damage to the teeth will bring in a Tech Geargolem and even more Chompies. Wipe them out to carry on destroying the teeth. The next enemy will be a pair of Geargolems, an Air one and a Tech one. I'd recommend attacking the Tech one on the right first to get them both closer together so you can more easily avoid both their attacks while circling around them. That's the last enemies you'll fight in here, finish destroying the teeth to move onto the next area. First just avoid the miniature Evil Glumshanks as he drives around the circle, no need to attack it or anything. Next up are some Grumblebum Thrashers as well as a pair of Boom Bosses firing at you. Keep moving and attacking until they're defeated and a trio of purple crystals crashes down into the arena. 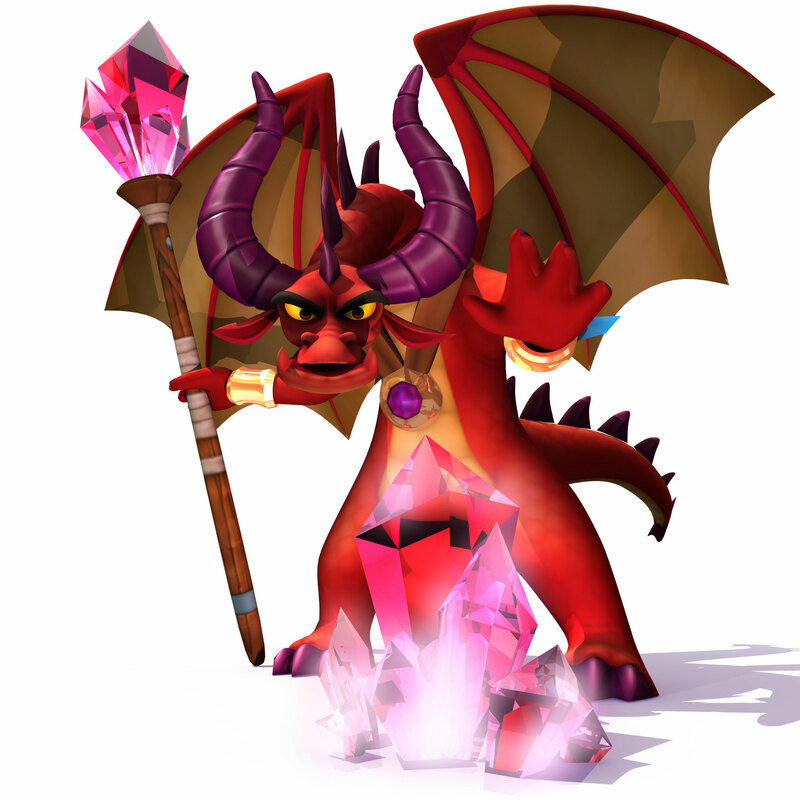 Attack the crystals while avoiding the incoming rocket attacks from Kaos. After that it'll be an attack by two Rip-rotors and a pair of Gazermages. With those gone it's three more crystals to destroy while avoiding the airship attacks. The next group of attackers are not much of a threat but do a tiny bit of damage so you will want to hit them away and not let them crowd you. The next crystal sequence has a little more dangerous enemies attacking, move back away from the exploding mines as they detonate. Once this last set of three crystals is destroyed you move on to the next section. Run to the right, jump over the obstacles but don't go too fast, every time you see him bring his hands closer together quickly stop moving and double back a short distance, he'll begin firing a purple beam of energy that you now need to jump over to avoid taking damage. Once you're over it keep on moving to the right. After several of those you'll reach the cannon at the end, fire it to defeat him and finish the story. Safely back at Woodburrow you've opened up a few new things to do. Wheellock down by the Under Hollow entrance has Score Mode unlocked for you to try, in it you go through each story mode level trying to get those most points you can. Avril over to the left of the pool has the Time Attack mode, this time you're racing through the story mode levels as quickly as you can. You don't actually have to go talk to them, the modes are also unlocked in the level select menu for you to use quickly. You've also unlocked the Nightmare level of difficulty, select it from the Options menu and you can play through each level with stronger enemies to fight. If you've already unlocked Nightmare and just completed the game with it you'll find a present next to Flynn with your [Hat - Volcano Hat] inside. And if you've completed 36 Swap Zone Challenges in Nightmare Mode you can also pick up [Legendary Treasure - Whizzing Whatsit]. They're all entirely separate levels, they're just on this one page because they're short. I think the game does send you straight from chapter 15 to chapter 16 but you can quit or go to Woodburrow and then return straight back to chapter 16 without having to do any of chapter 15 again. And yes all Skylanders revive and heal between each chapter. First, is 15-16-17 a continuous path or can you power off the game between 15-16 or between 16-17 and save your progress? Second, do your Skylanders regenerate between 15-16 or 16-17 or if they die in 15 do they stay dead? my fave part is when you fight glumshanks in his brain. Has anyone noticed on the wii version that after beating the game, in the place where there is a elemental chest, there is another one off to the side, it looks like a spark lock, but when I press (-) nothing happens. If anyone could help that would be great. Thanks! Didn't even realize where that first treasure chest was. Thanks a bunch. Its a spyro forum not a who wrote the first comment forum!!! and @SkylandersGamer no one does on facebook people dont write first on a comment when they are first to comment on it. You know, no one cares if you're "first". It's not a competition. On topic- Thank you dark52, for yet another great walkthrough!